When I want plump seasoned garlic tasting shrimp. 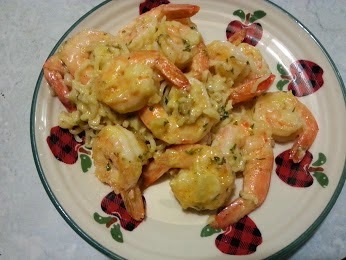 shrimp scampi come to my thoughts. I like the way I serve it over ramen noodles. serve this to night and watch the smile on your family and friends faces. In a sauce pan melt butter on medium heat. (be sure not to burn). add onion and garlic saute until lightly cook.add shrimp cook until lightly pink. add cream chicken soup and garlic powder coat well and toss with shrimp. Please don't over-cook the shrimp. add parsley on top and serve over cooked ramen noodles. when you cook the ramen noodles, cook them without the season package. cook the the noodles dry not real wet. you want them like rice or pasta.